Metal on metal hip replacement implants are heralded as being more resilient, durable, and long-lasting than traditional hip replacement devices, ideal for younger patients and those with an active lifestyle. However, metal on metal hip implants have increasingly become subjects of controversy, as they have been linked to serious complications such as premature failure rates, metal poisoning (metallosis), bone fracture, and other problems. Patients experiencing these complications frequently require revision surgery, a second surgery to remove and replace the initial hip device. In January 2013, the FDA (Food and Drug Administration) issued a safety communication alerting orthopaedic surgeons, healthcare providers, and patients to the “unique risks” associated with metal on metal hips, including “adverse local tissue reaction,” and “adverse reaction to metal debris.” Earlier, in 2011, the FDA ordered all manufacturers of metal on metal hip replacement systems to conduct postmarket surveillance studies on the devices. The goal of hip replacement, also called hip arthroplasty, is to relieve pain, repair damage, and restore range of movement by either rebuilding or replacing the patient’s hip joint. This hip joint is comprised of two main parts: a femoral head, which is the large ball-shaped bone at the top of the femur, and the cup-shaped acetabulum. Together, the femoral head and acetabulum work smoothly as a ball-and-socket joint. Hip replacements are designed to mimic these movements as naturally as possible. Two of the biggest differences between implants are the material and size (based on the patient’s size) of the individual components (femoral head and acetabular cup). In the U.S., hip implant manufacturers have produced parts made from ceramic, plastic (polyethylene), and metal – or a combination of these materials. In the 1990s, Birmingham surgeon Derek McMinn developed the first metal-on-metal (MoM) hip implant. Dr. McMinn hoped to create a stronger and more resilient implant that would be less vulnerable to wear and be more customizable in size. In 1997, the first MoM hip replacement was available for sale on the European market. 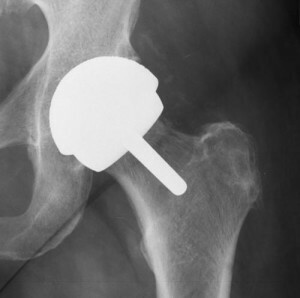 The device rose quickly in popularity, and manufacturers around the world soon began developing their own metal on metal hip replacement components. In the early 2000s, metal on metal hip implants shot to popularity in the United States. These devices were marketed as the best solution for younger hip replacement patients with active lifestyles, and who required durable implants that would allow for exceptional range of motion. Major manufacturers, including DePuy, Zimmer and Stryker, developed metal on metal hip implants that were received by hundreds of thousands of patients. But despite manufacturer claims and successful advertising, consumers and medical professionals soon began reporting higher than expected early failure rates, metal poisoning, and other serious complications from MoM devices. On May 6, 2011, the FDA required MoM device manufacturers to conduct post-market surveillance and safety studies of their devices. By January 2013, the FDA had enough data to issue a Safety Communication, warning surgeons and patients that metal on metal hip implants could cause soft tissue damage, pain, and other complications. The FDA’s 510(k) clearance process allows device manufacturers to “fast track” new products onto the U.S. market. To do so, each device must qualify as “substantially similar” to an already-approved device; it is then granted market clearance, without any further testing or trials required. The process is designed to streamline the approval process, allowing devices with proven technology to enter the market faster than products that have yet to prove their safety and durability. One of the major complaints regarding the 510(k) clearance system is that a new device may be based on old technology that is later proven unsafe or problematic. Therefore, bypassing clinical trials and other safety precautions can allow an unsafe device to be fast-tracked for the U.S. market. According to some injured patients and experts in the medical community, such may be the case with metal on metal hip implants. The FDA has also expressed concern over these devices: On January 17, 2013, the FDA issued a proposed order that will require all metal-on-metal hip replacement manufacturers to request premarket approval via PMA applications. Before this change, all MoM hip implants were regulated under the 510(k) program, and designated as Class II (higher risk) devices. Under the proposed system, the FDA would approve or deny metal on metal hip replacement devices on a case-by-case basis. Metal-on-metal hip implants are marketed as durable, longer-lasting devices that resist dislocation and provide better movement, making them ideal for younger and active patients. Some medical experts, however, do not consider MoM devices to have enough advantages to outweigh their potential risks. In fact, an 18-member FDA review panel found that there are few circumstances, if any, in which metal on metal implants are preferable to other implant alternatives. “I do not use metal-on-metal hips, and I can see no reason to do so,” stated Dr. William Rohr, a surgeon at Mendocino Coast District Hospital, and FDA panel chair. After receiving more than 17,000 complaints linked to metal on metal hip replacement devices, the FDA convened the panel. The resulting Safety Communication enumerated a long list of patients who should not receive MoM implants – among them, female patients and those with high levels of physical activity – and a detailed list of pre- and post-surgical guidelines to follow. By 2010, approximately 27 percent of all U.S. hip replacements – more than 105,000 procedures – involved MoM devices. By 2012, the FDA had received more than 17,000 adverse event reports (consumer complaints) related to metal on metal hip implants. The federal agency – and device manufacturers – took action. In March 2007, the FDA wrote a warning letter to Stryker Orthopaedics regarding poor manufacturing and safety practices. In November 2007, the FDA sent Stryker a second warning letter, this one regarding quality control issues at the company’s New Jersey facilities. On January 22, 2008, Stryker recalled its Trident Hemispherical Cup System and Trident Acetabular Cup System. In July 2008, Zimmer temporarily suspended sales of the Durom Cup, in order to investigate reported high failure rates. The Durom Cup was later placed back on the market with updated surgical instructions. In 2009, the FDA sent Johnson & Johnson, DePuy Orthopaedics’s parent company, a letter detailing safety concerns for a pending hip resurfacing device. On August 24, 2012, DePuy recalled its ASR hip implant system after reports of high failure rates; the recall affected 93,000 patients worldwide. The FDA and medical device manufacturers continue to monitor the safety of metal on metal hip replacement devices, with the intention of providing consumers and doctors with an accurate portrayal of the benefits and risks. Meanwhile, many patients who have been injured have filed metal on metal hip litigation against the manufacturers for marketing dangerous products, and for failing to warn the public about the possible risks.